Darwin Theodore Troy Turner was an African American literature critic, a poet, and an English professor who was born in Cincinnati, Ohio on May 7, 1931. His grandfather, Charles H. Turner, was the first African American psychologist; his father, Darwin Romanes Turner, was a pharmacist; and his mother, Laura Knight, was a school teacher. Considered a boy genius, Turner enrolled into the University of Cincinnati at the age of 13 and received his undergraduate degree within three years with Phi Beta Kappa honors as the youngest student ever to graduate from the school. In 1949, at the age of 18, he received his Masters degree in English and American Drama from the University of Cincinnati. By the time he was twenty-five years old, he received his PhD degree from the University of Chicago. 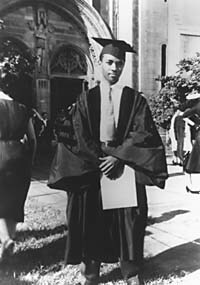 In 1949, the same year Turner earned his Master’s degree, he married Edna Bonner and started his teaching career at Clark College in Atlanta, Georgia teaching English. He then accepted an assistant professorship position at Morgan State College in Baltimore, Maryland in 1952, balancing both a teaching career and earning his doctorate degree. A year after receiving his PhD, he held various administration positions at various colleges. From 1957 to 1959 he was the chair of the English department at Florida A&M. From 1959 to 1966 he worked at North Carolina Agricultural and Technical State University and then accepted the Dean position at their Graduate School from 1966 to 1970 until he left for a position at the University of Michigan. During that time, he divorced Bonner in 1961 and remarried in 1968. His new wife was Maggie Jean Lewis, a school teacher. Turner became the chair of the Afro-American Studies Department at the University of Iowa in 1972 and was a professor there for nearly two decades. In 1981, he was made the University of Iowa Foundation Distinguished Professor of English. Turner edited more than a dozen works of African American literature and published his own writing, including a collection of his poems in Katharsis in 1964, a book on American writer Nathaniel Hawthorne’s novel The Scarlet Letter in 1967, and a literary critique, In a Minor Chord: Three Afro-American Writers and Their Search for Identity in 1971. In a Minor Chord was an analysis on the writings of Jean Toomer, Countee Cullen, and Zora Neale Hurston. Turner edited The Wayward and the Seeking: A Collection of Writings by Jean Toomer in 1980, co-edited The Art of the Slave Narrative: Original Essays in Criticism and Theory in 1982, and wrote for Haki R Madhubuti’s Earthquakes and Sun Rise Missions in 1982. His other major edited anthologies include Black Dramas in America and Black American Literature. Turner wrote dozens of articles for academic journals and anthologies as a literary critic of African American literature. Darwin Turner died from a heart attack at the age of 59 on February 11, 1991 at Mercy Hospital in Iowa City, Iowa. Joe Weixlmann, "A Tribute to Darwin T. Turner (1931- 1991)," Black American Literature Forum 25:1 (Spring 1991); http://www.nytimes.com/1991/02/21/obituaries/darwin-turner-59-a-professor-of-english.html; http://www.oxfordaasc.com/article/opr/t0001/e3933.